Holiday Spicy Super Sale – I Love It Spicy! Superhot chili peppers are a gift and I intend to spread the word. I’ve been cooking with superhot chili peppers for quite some time now, though I don’t remember them always being called “superhots”. The name just sort of appeared along with the rise of peppers that crossed the 1 Million SHU line. It was inevitable, really. You need a moniker for something so astonishing, something I consider flat out awesome. My love for chili peppers began like most others, being introduced to them as a child via the popular jalapeno pepper. That was my gateway pepper. The hottest pepper I had tried before that was the pepperoncini, and even that brought on the spice for me. With the jalapeno, I remember thinking, “Yes! Talk about heat! Flavor!” I was hooked from then on. We are spreading the love for all things spicy in the way of this sale. 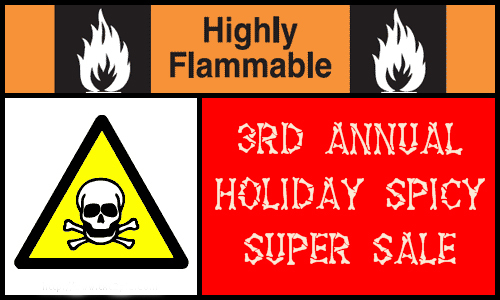 We have gathered some of the best small market companies who make fiery products of all types and list them here with their own private sales for the holiday season. If you are looking for a gift for a spicy companion or just want to capitalize on some of these amazing offers, this is your opportunity to take advantage of their sales. So please browse through all the listings, and check out the links by clicking on their company names and see what interests you. We you find something great.